I am excited to partner with Carpet One Floor and Home Welcome Mat to bring awareness to the importance of cancer research. For the past decade, Carpet One Floor Home has raised almost a million dollars to support breast cancer research. 25 percent of the proceeds of each Welcome Mat goes towards the research. Each Welcome Mat features a sturdy rubber backing and a pink ribbon to remind people of the cause it supports. All welcome mats measure 2' by 3', and are stain and water resistant, machine washable, made in the USA, and can be used indoor or outdoor. These mats not only support a good cause, the clever designs make a beautiful and functional personal style statement. The welcome mats are available all year long in Carpet One Floor and Home stores throughout the U.S. The mats retail for approximately $24.99 US/$34.99CDN. 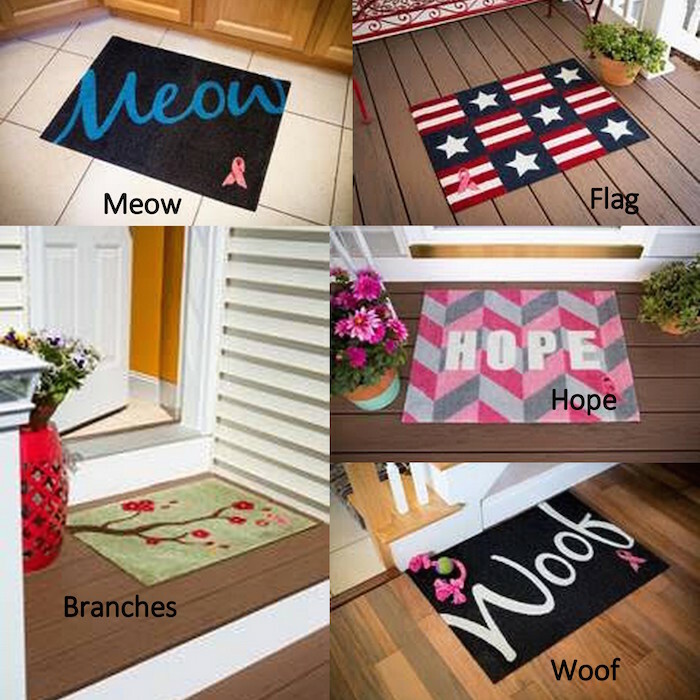 If you are in Canada or USA and would like to win one #WelcomeACure Designer mat before November 8th please leave a comment mentioning which design you like the most out of the five (meow, flag, branches, hope, woof), and follow my social media links to be eligible to win. I really like the Branches mat! Canada... and the one pictured is really pretty. I live in Canada and love the Hope mat. Thanks. I am in the U.S. and my favorite design is Branches. I am in Canada and love the branches! I like The Cat's Meow Mat! I'm in Ontario Canada and I love the Woof. From USA and love the Meow one! I live in Canada. I like the Branches design. Very nice! From Canada and I LOVE the branches! I am from Canada and I love the branches mat. I'm in Canada and I like the branches mat. I'm from Canada. I most love the Meow carpet. I am in Canada and love the branches mat! I live in Canada and I love the Branches mat. So pretty! I'm in Canada. The branches mat is my favourite. I'm Canadian and I like the Woof mat. I am in Canada and I like the Branches design the most. Thank you! I'm in Canada, I love the meow mat best of all! im in canada and i love the branches! I am in Canada and I like the Branches mat. I am in Canada and I like the WOOF! I'm in Canada and I like the Woof mat, but they are all nice!! I live in Canada and I like the woof welcome mat. I'm in Canada and live the branches! I'm from Canada and I like the branches mat. I am from Canada and I like the meow design. I'm from the USA and I love the moew design! I live in Nova Scotia, Canada and I like the Branches Mat the best. From Canada. Love the branches design! I'm in Canada and would love the branches mat. I'm from Canada and my favourite is the Woof mat!! I'm from Canada and I love the Branches mat! I'm in canada, and I love the branches! I am from Canada and like the Branches rug the best! I like the Branches pattern the best. I'm from Canada. I like the Meow design. I am in Canada. I like Branches. I'm in Canada and I like the Branches. I'm in Canada. "Branches" mat is my fave. I'm in Ontario, I love the Branches mat! I live in Canada and The Branches is my favourite. I am in Canada. I like the Branches welcome mat the most. I am in Canada and Woof is my favorite. I am from Canada and I like the Hope design. I am n the USA and I like the branches design. I'm in Canada. I love the Branches. I'm in Ontario Canada and my favourite is the woof mat. I am from Canada and I really like the branches mat.